We have three methods to monetize YouTube videos in which third method is best . • First method is applied while uploading a new video. • Second method can be used after uploading a video or for already uploaded videos. • Third method is used for those videos which you will upload in future, those videos are also known as future uploads and in this article I will explain all the three methods. But before explaining these methods you should be aware about the rules and regulations of YouTube and you should know the terms and conditions of YouTube. When you are done with the above said things then you will be ready for the next step. So Our next step is to upload a video and monetize it, which I will tell you in this article. 1. First method to monetize our videos on youtube. This method is usable only for those videos which you will upload in future or for those videos which you are uploading at the moment. First of all you will have to upload a video and if you have already uploaded a video and wanna monetize that then follow the instructions given in our second method below. So how to do monetize our uploading videos/new videos? ==> Click on upload video, which is an upward arrow sign. ==> while uploading your video there will be five options in front of you as shown in the pic below. ==> save the changes after your upload and processing is done. ==> Now click on publish and your video will be monetized. 2.Second method to monetize YouTube videos. In the second method we will be monetizing already uploaded videos not the uploading videos. So by this method you can monetize already published videos, by this method you can monetize all the videos at a time or one by one. So how to monetize YouTube videos by this method? ==> Click on the three small lines present in the top of the left corner of your screen. ==> Click on video manager. ==> Now you can check box those videos which you want to monetize. ==> Click on actions as shown in pic below. ==> Now check all the boxes to accept monetizing terms and condtions. ==> Click on submit and you are done. 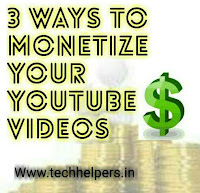 3.Third method to monetize YouTube videos. This method is the best method among all the three methods as by monetizing your videos with this method, you don’t have to monetize your future uploads again and again. Which means you will get rid of monetizing your videos everytime you upload new videos. So how to do monetize your YouTube videos by this method? ==> First of all sign in to YouTube with your channel. ==> Click on gear icon (three small lines). present in the top left corner of your screen. ==> Click on my channel. ==> Now click on video manager. ==> Click on channel which will be present in the left hand side. ==> Now click on upload defaults. ==> Check box of monetize your uploaded videos as shown below in pic. ==> Click on save changes and you are done. Now you don’t have to worry about monetization, now your new uploaded videos on YouTube will be automatically monetized. After monetizing our videos most of newbies suffer a lot because of less views (low no.of views) on their videos and they also suffer because of very low number of subscribers. If you are new in this field then it’s not only you who is suffering, it was almost everyone and I was also like you and I know how it feels but you have to keep working on it to get success. This type of Target cannot be achieved without Hardwork or you cannot get sucess without pain ,we have many topics on YouTube views and subscribers. So you can check them also to increase your subscriber count and views on your YouTube videos. Extra tip: Additionally I have tip for new youtubers that always try to upload videos according to your channel name and try to upload unique/different videos which people usually search and make videos according to the market demand. Like if demand is of android based topics and you will make videos related to windows phone then how will you get more views and subscribers. Do follow all the tips and methods and you will be able to monetize your YouTube videos easily.